My name is Francisco de Salles. I am a University professor and I teach engineering courses in the city of Campinas (Brazil). Providing only a theoretical material to students is not enough for them to memorize information. Consolidation exercises are a must for e-Learning courses. Because more practice was needed, students requested more exercises that will help them better learn the topic. So I decided to create interactive tests and quizzes. As a result new challenging exercises motivated students and deepened their knowledge and understanding of the subject. I searched the Internet to find a software for creating tests. That is how I found iSpring QuizMaker and chose it as my tool for test creation. While many authoring tools fell short, QuizMaker met all my expectations. I have been using iSpring QuizMaker since the year 2012 and it fits like a glove. It is very user-friendly. It is very easy to use, thanks to its intuitive interface. Plus students can practice as many times as they wish. I mainly use the tests created with iSpring for exercising during the class. I love how the QuizMaker corrects and collects the score itself (thanks to the “send quiz results to email” feature!) The students like it as much as I do. I created a special website with tests for students, who found this website as something exciting. I can prepare the questions in EXCEL and then transfer them to QuizMaker, this is very easy, saves my time and the preparation is much simpler. It is very versatile and I can publish my quizzes in Flash and HTML5, So that students with iOS and Android tablets can take advantage of them. Many questions in the exact area have the facility to present “numbers” in the responses and, in my opinion, the multiple choice questions are easy to compile, because the answer is just a “number”. The great advantage of QuizMaker is to vary the type of questions to engage students. Students prefer the multiple choice questions because of their objectivity. 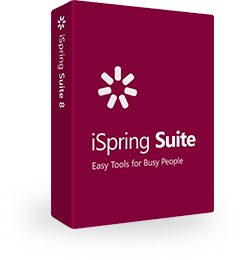 I am happy because iSpring fits my needs perfectly and provides excellent results, both for my students and me. As per the iSpring Support Team, it is great and always ready to help at any time. I would recommend iSpring to everyone, because it is wonderful. You only need to try it once and you will definitely like it. Would you like to share your success story about using iSpring in business, academia, government, or any other sphere? Contact us, or leave a comment below!